onto digital platforms like web-chat, text message and social media. The CDC reports dating violence affects more than 50% of all high school students. To put that in context, more than half of all high school students will experience violence such as slapping, hitting, punching and kicking. This also includes emotional abuse such as put downs and name-calling, and places young people at risk for mental health issues, depression, and drug and alcohol abuse. A report by Liz Claiborne that shows young people ages 18 and up are still grappling with this issue as they move into college as young adults. Almost 60% of college students had difficulty identifying dating abuse, but even worse, that same 60% couldn’t identify how to help (or where to find help for) a friend who was experiencing abuse. The tragic reality for many young people is that, even if they want to get help, they have no idea where to start, much less how to address the issue in their own lives and communities. This study was one of the primary drivers behind the the creation of loveisrespect.org, our first digital services effort. When we launched the site, we hoped to become the ultimate resource to help teens and young adults find the help they needed to leave and end abusive relationships. Funding was secured in mid October of 2006 with a specific launch date of the first week in February 2007. Initially, we identified Tocquigny Marketing in Austin as a contractor for development of logo and brand assets, as well as a website, while we approached the technical aspects of the services, including a one of it’s kind web-based live chat. Almost immediately post-February-launch, we realized we needed a much more robust blog service for the site than had been initially developed, and a greatly expanded social media presence. These we facilitated in-house, rebuilding our own WordPress site, expanding our blog capabilities and ramping-up our content creation strategy. Over time, as we looked at how young people were utilizing our services, we realized that we were only available if they were at home, by the computer and had time to dive into a chat. We also knew that young people didn’t always feel comfortable calling. Pew American Life project (as well as Nielson) tell us that teens and young adults are utilizing text messaging at incredibly high rates – 63% of teens use and exchange text messaging every day compared to the 39% that make voice calls. Armed with this knowledge, we created the first text-for-help service for teens and young adults across the U.S. We were certain that young people would immediately use this service as a way to gather information, find service referrals, and educate themselves – much like they use our traditional chat and phone. We expected it to be an entry point to our service that would escalate text users to traditional chat or phone services as the problems they presented became more severe. The first text was sent by Vice President Joe Biden. 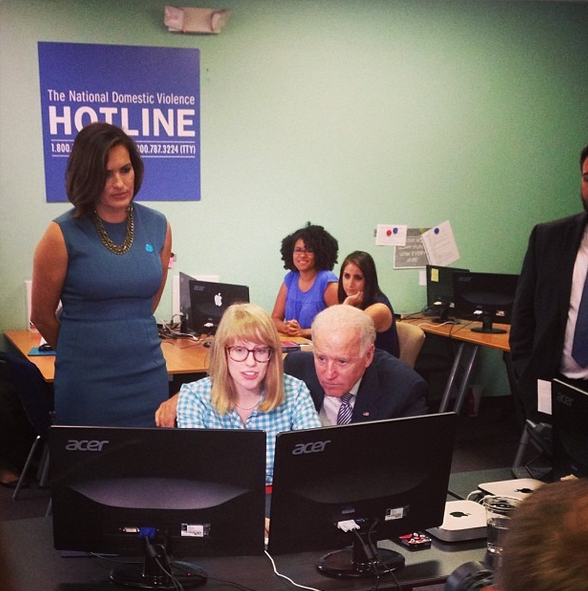 Joe Biden and actress Mariska Hargitay observing digital services in action on a recent tour. Almost immediately, and with zero paid media, the service exploded – but not in the way we expected. Our users weren’t using us as a gateway, they were contacting us in crisis, they were looking for solutions and information to help them leave abusive relationships, but even more used our service to decide if that thing that just didn’t feel right in that new relationship was unhealthy. They wanted to bounce feelings off our advocates but they also wanted someone to explain to them what a healthy relationship looked like. We found ourselves not only dealing with crisis (in 160 character bursts) but also in prevention, stopping the development of an abusive relationship by being there for that young person and listening to questions and feelings about something that didn’t feel right. It became a healthy check in, like going to the doctor – if it doesn’t feel right, get it checked out. Further more, much like how AIDS.gov has reported users searching their site with a mobile device, teens and young adults used our text messaging service to specifically focus on what they needed in that moment. This was different from a phone call or a chat, in that we didn’t have as much time to learn what the needs of the person were as we did when they called or used the web chat. Instead we had to immediately provide support in links from our website, with information about breaking up safely, resources on obtaining a protective order or blog posts that they could read over and think on. While it wasn’t what we expected, it has allowed us to deliver faster and more efficient service in a way that avoids exposing the young person or forcing them to make a decision in the moment. Moving forward, our goals are to maintain and sustain the service line through creative IT and staffing solutions. We are no longer hamstrung by our service lines – the chat and text can scale infinitely – the problem becomes having the staff and the strategy to help those in need. Also, we’ve realized the need to keep looking forward to what’s next, and building capacity in our techniques and knowledge base, so we can tackle the next big thing, and be there to answer the call, whatever channel it’s on. Digital services offers a unique opportunity to engage victims of abuse on a variety of channels, over a range of issues, wherever they may be in their personal journey. Our blogs on both the thehotline.org and loveisrespect.org offer powerful tools for our advocates to address not only issue-related content (like protective orders or sexual coercion,) but also provide entry-points to conversations through posts about pop-culture events, like reality television, and examples of unhealthy relationships in celebrity circles. Social media accounts also represent a unique challenge for a confidential service such as ours. Our Communications team has worked closely with our advocates to facilitate 24-hour monitoring of accounts to ensure no unsafe or inappropriate content is posted. Such monitoring – while common in the private sector – is difficult to accomplish in a resource-constrained environment such as a not-for-profit, even though it is critical in maintaining a victim’s safety. Currently, we have agency profiles on Facebook (2), Twitter (2), Instagram, Tumblr, LinkedIn and Pintrest. While each represents a different potential conversation and content type, all provide valuable opportunities for engagement, and ultimately to help victims in need. White House video of Vice President Biden’s most recent visit to the Hotline. After five yeas of successful operation on loveisrespect.org. in the October of 2013 our communications team began building out a new website for thehotline.org, to facilitate the launch of chat services. The new site would feature a responsive design, optimized for mobile, along with revised content and a long-planned spanish language expansion. The chat services expansion was underwritten by Verizon and kicked off by a visit to the hotline by Vice President Joe Biden. Victims with disabilities utilize chat services at a rate of 2.6% vs 0.9% on phones. Rural utilization of chat is 8.9% vs 0.9% on phones. Chat services provided an increased sense or perception of anonymity for users with sensitive issues like immigration, economic abuse, batterers working in law enforcement, or military partners and sexual abuse. 25-35 year olds make up our largest demographic, but our second largest is comprised of 26-45 years old, signaling low barriers-to-entry for older audiences. Traffic to hotline chat from mobile devices has topped 30% and continues to grow.